Flex Strap Bowls combine the durability of 304 stainless steel with the function of our patent pending Flex Straps. This unique take on the traditional camping bowl allows you to securely hang it from your backpack to save precious pack space, hold it more comfortably to reduce the risk of spills, and ensure no one steals your bowl with the different colored straps. 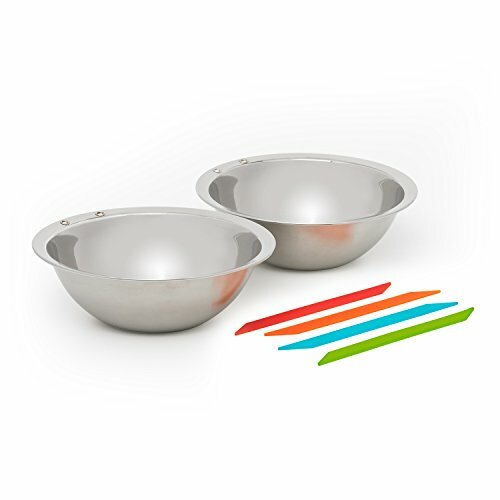 UPGRADE YOUR BOWLS - This patent pending design adds a flexible silicone strap to nearly indestructible stainless steel bowls. This simple upgrade makes a huge difference. EASIER TO HANG - Flex Straps keep your bowls clean and dry by allowing you to hang them up after each use. Hang it on a tree, on your pack or in your tent. EASIER TO HOLD - Spilled food is the thing of the past with Flex Straps! Slide a finger in the Flex Strap for added stability and you'll never drop your bowl again. EASIER TO CUSTOMIZE - With 4 colored Flex Straps included in each set, claiming your bowl is simple. Kids and adults will both enjoy how easy it is to personalize your bowl. DURABLE - Made from premium 304 stainless steel, your Flex Strap Bowls will provide you with years of rugged use. If you have any questions about this product by Solo Stove, contact us by completing and submitting the form below. If you are looking for a specif part number, please include it with your message.